Our group of twelve was picked up at a designated meeting point in the afternoon on a chilly day in Paris by Jolanda, Captain of the canal barge La Belle Epoque, owned by European Waterways, for the trip in two private minibuses to the village of Venarey-les-Laumes, a three hour drive of 180m kilometers. 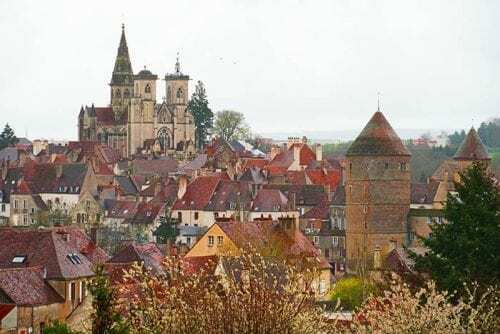 Burgundy France town of Semur en Auxos with original towers of original town from 13th century. Our route south out of Paris took us along the left bank of the River Seine and past the Eiffel Tower as a slight mist began. Soon the mist evolved into a heavy rain. Sometimes the promise of spring this time of year is still a well meaning wish. But unpredictable weather is, well, unpredictable. The grand architecture of Paris soon rarified on our drive out of the congested city as the French countryside weighs more heavily toward cows than people. Soon only white Charolais cattle dot the rolling pastures of emerging green. A variety of budding trees mixed with an occasional spattering of pink blossoms along our route is giving its annual signal that spring is well on its way. 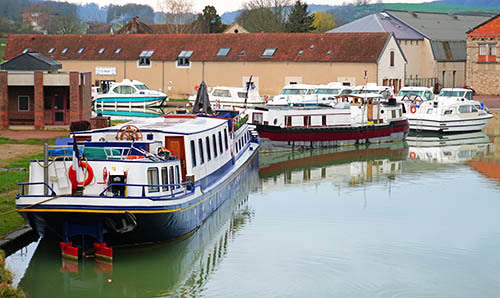 Upon arrival at the barge mooring on the Burgundy Canal (Canal de Bourgogne), the six-member crew of La Belle Epoche greeted us for a “Welcome Aboard” complete with champagne and canapés. Led by Captain Jolanda, residing in France but originally from the Netherlands; the crew consists of Master Chef Bryan, from the United Kingdom; hosts Claire, born in Michigan, and French native, Jordan; deckhand Luke and pilot Fred, all currently living in France. 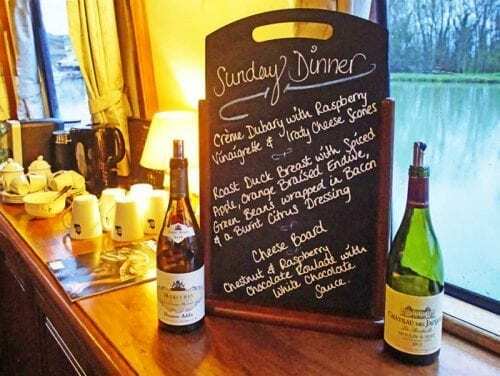 Menu board for dinner onboard La Belle Epoque canal barge in Burgundy France with bottles of Burgundy produced wines. Our cruise, the first of the season for La Belle Epoque, is booked by France Cruises, a company that often books groups for themed cruises on the ships they represent. Wine appreciation, walking, and family tours are just a few of the group themes. Ours is a fun-loving group of photographers from the U.S., Canada, and Australia who are very well acquainted having done various photo tours together worldwide over many years. The captain and her crew immediately recognize our familiarity and are quickly caught up in our group’s customary levity, which can border on silliness at times. Our highly anticipated first dinner aboard La Belle Epoque is an impressive four course meal prepared by Bryan with the menu posted in the dining room, features roasted duck and the first three of 30 French cheeses to be sampled during the week.